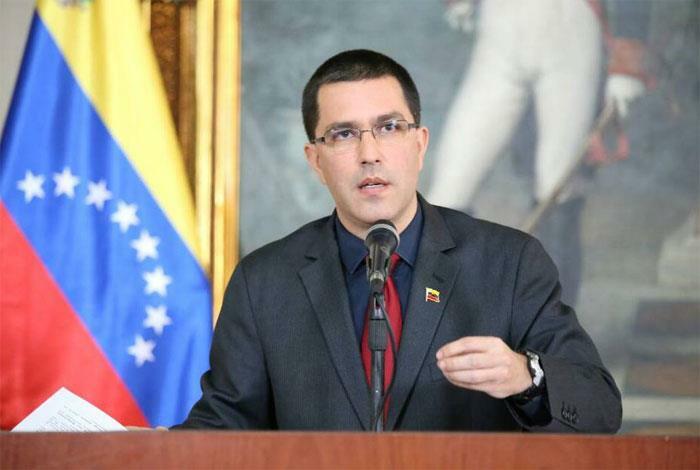 Venezuela Accuses U.S of "Promoting a Coup"
CARACAS, Jan. 16 (Xinhua) -- Venezuela's Foreign Minister Jorge Arreaza on Wednesday accused U.S. Secretary of State Mike Pompeo of "blatantly promoting a coup d'etat." Arreaza responded in his Twitter account to a message written by Pompeo, in which the U.S. official congratulates Venezuela's National Assembly (Congress) for declaring President Nicolas Maduro as "usurper." In addition, Pompeo cited three articles of the Venezuelan Constitution, which, in his opinion, state that the Congress, which has an opposition majority, assume executive responsibilities. In this context, Arreaza pointed out that Pompeo cites "articles of a Constitution that he evidently doesn't know." Arreaza denounced that Pompeo leads "a criminal economic blockade and an operation of international aggression against Venezuela." "While President Maduro seeks a respectful dialogue with the U.S., Pompeo and other extremist voices seek to destabilize the country and incite violence," Arreaza added. The Venezuelan official lamented that "due to a lack of dialogue between government and opposition in the U.S., the federal government is shutdown," and that is why Pompeo is not able to receive a serious report that allows him to understand the Venezuelan Constitution.